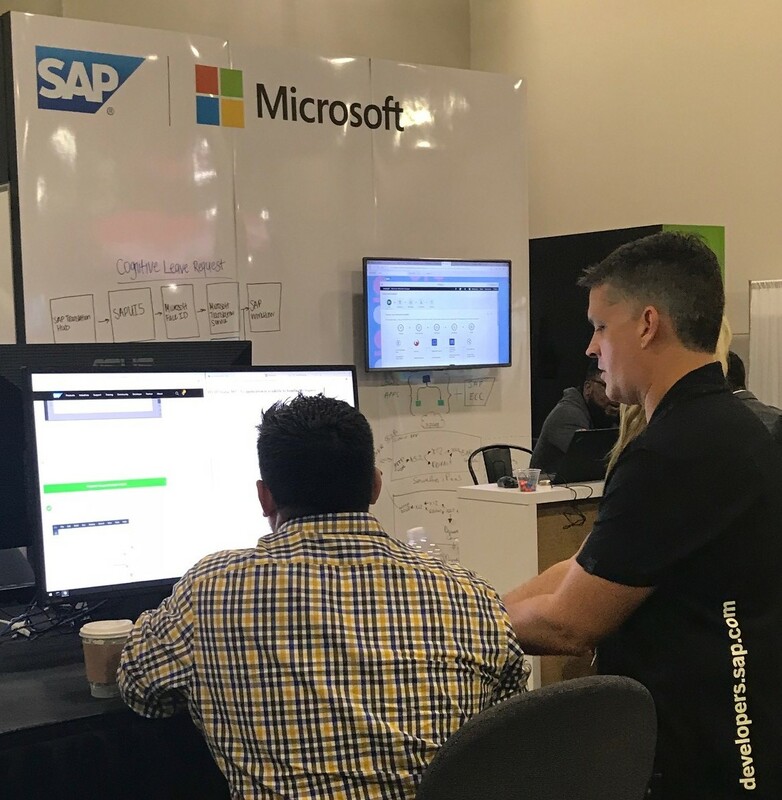 In a few hours, the doors will open for the second day of SAP TechEd 2018 in Las Vegas. 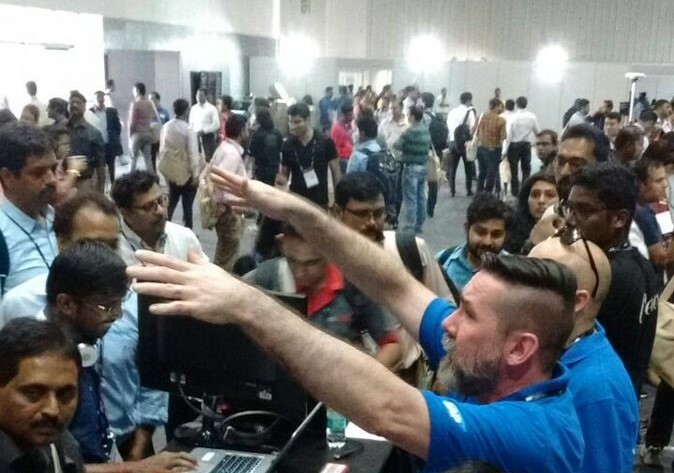 When I attended SAP TechEd last year, I found myself spending a good chunk of my time giving out swag. I didn’t mind — it kept traffic steady, and offered me an opportunity to chat with members — but I didn’t get to engage as much as I would have liked. 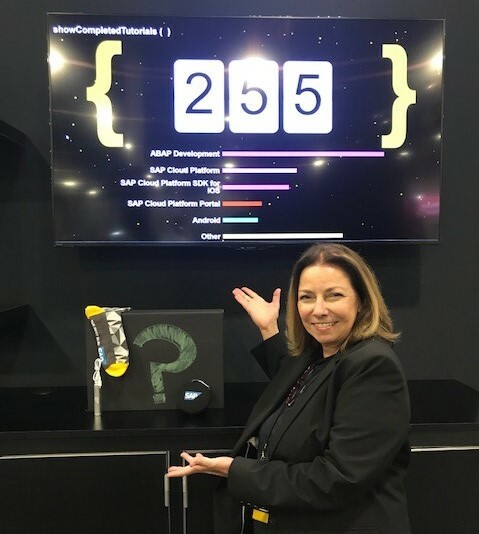 This year, with one day of SAP TechEd in the books, things are different (and not just because I’m in a slightly different role). As Craig promised in a blog post back in August, SAP TechEd this year is all about engagement. And from where I was sitting, that promise was met. Now part of Developer & Community Relations, the Community & Influencers team (which is where the SAP Community team now resides) has a very nice set-up called the Community Lounge, and that is part of a much larger show-floor space called the Developer Garage. Yesterday, all the stations within the area remained busy throughout the day — activity ranging from respectable to hopping depending on the hour. But what does that have to do with engagement? And while we’re on the subject of superstars: Even before the show began, banners went up to recognize our Developer and Community Heroes. They were feeling the love throughout the day on social media. Watching members support and congratulate each other is a great reminder of what community engagement is all about. Elsewhere in the Community Lounge, security experts were on hand to help visitors through a Capture the Flag challenge, meant to test their cyber-security abilities. And that’s just a taste of what occurred. More of the same…a whole lot more! See bullet list above. The photographer will continue to take head shots, and Capture the Flag will give visitors the opportunity to try their mettle when it comes to cyber security. My head shot. Turns out I don’t have a good side. I need a hero. Heroes and contest winners will be visiting the Community Lounge today, and if they aren’t feeling camera shy, they’ll sit down for quick video interviews which will appear on Twitter. Tutorials and missions and prizes…oh my! The App Space is unquestionably one of the hottest spots in the Developer Garage, and I doubt that will change during the duration of the show. Here visitors can take a variety of tutorials and missions — and earn prizes for completion. Pictured: People smarter than me doing developer stuff in the App Space. Catherine LaCroix: kindly Vanna Whiting to show off the App Space prizes. Howdy, partner. The Developer Garage includes four spaces dedicated to collaborations with partners: AWS, Apple, Google, and Microsoft. No partner favoritism. This is the best pic I took. Plus there’s a Member of the Month in the chair. Is this real life? 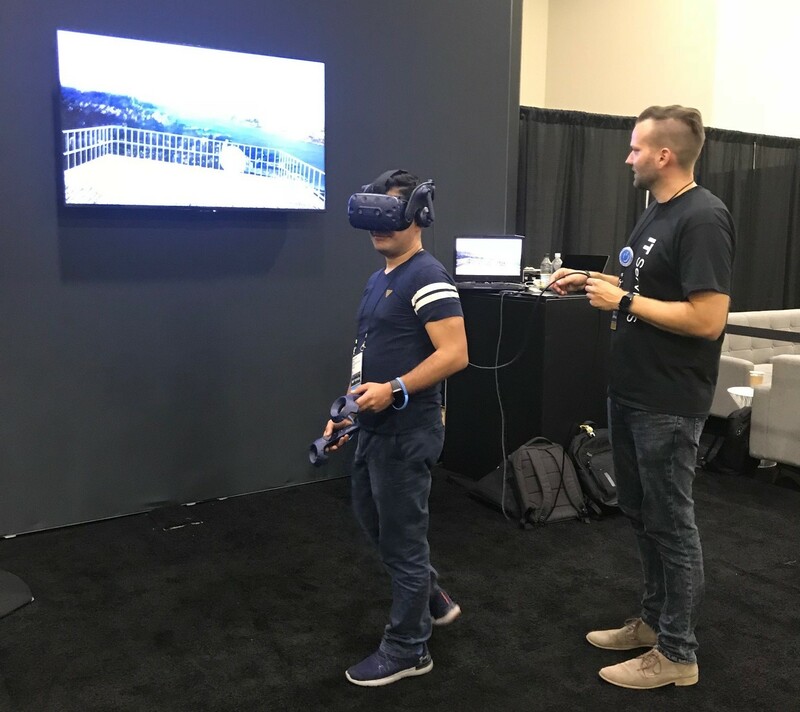 The Community Lounge has a cool VR display where visitors can use virtual reality to learn more about how SAP runs SAP. I’m trying to enjoy myself but this guy named Agent Smith keeps harassing me. Yeah, but is it art? 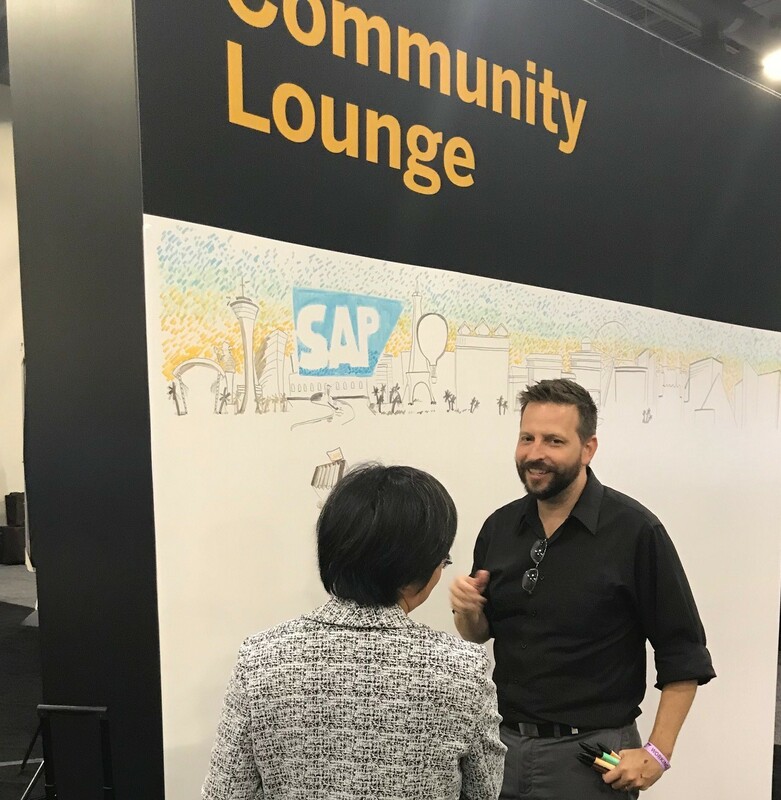 There will be an artist at the Community Lounge every day, and he’s working on a mural to illustrate what’s happening at SAP TechEd. Visitors can stop by and give him their impressions of the show — and he’ll work their feedback into the mural. Engagement…collaboration…this one’s got it all! Visit the Community Lounge and contribute to this masterpiece! Come to Vegas for the theater. 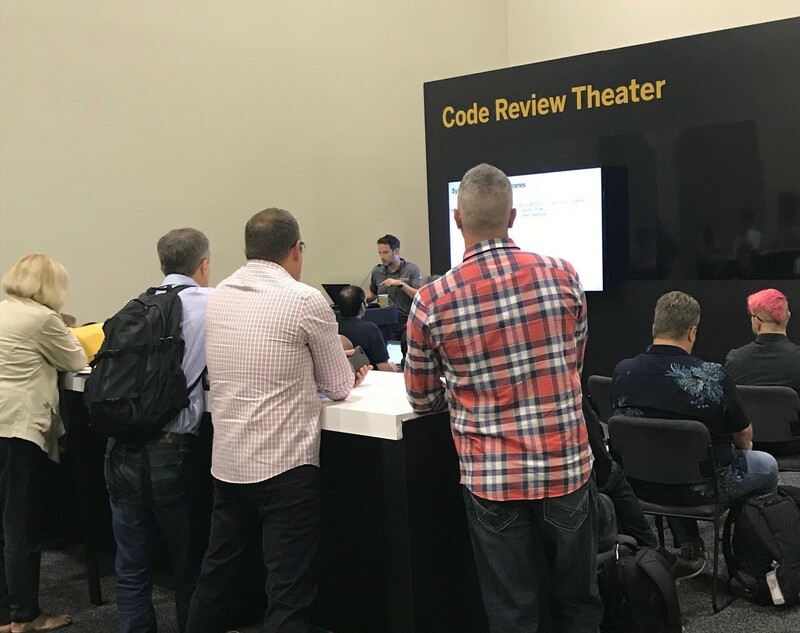 The Code Review Theater will hold sessions throughout the day. Follow SAP Community on Twitter to see which sessions should interest our members. (We did this yesterday with the “Best Practices for Interaction Within the Community” session led by Christian and Tammy — and with the Female Influencer Fireside Chat. There’s another “fireside chat” scheduled for today at 5:00 p.m., in fact.) We also have three SAP CodeJam (mini-edition) theaters for deeper dives into technological topics. Standing room only at the Code Review Theater. It’s the hottest ticket in town! Cream? Sugar? Did I mention that the Community Lounge is right next to a café where you can get free coffee and energy drinks? Because the Community Lounge is right next to a café where you can get free coffee and energy drinks. You know, just in case you’re in attendance and you need even more incentive to stop by. 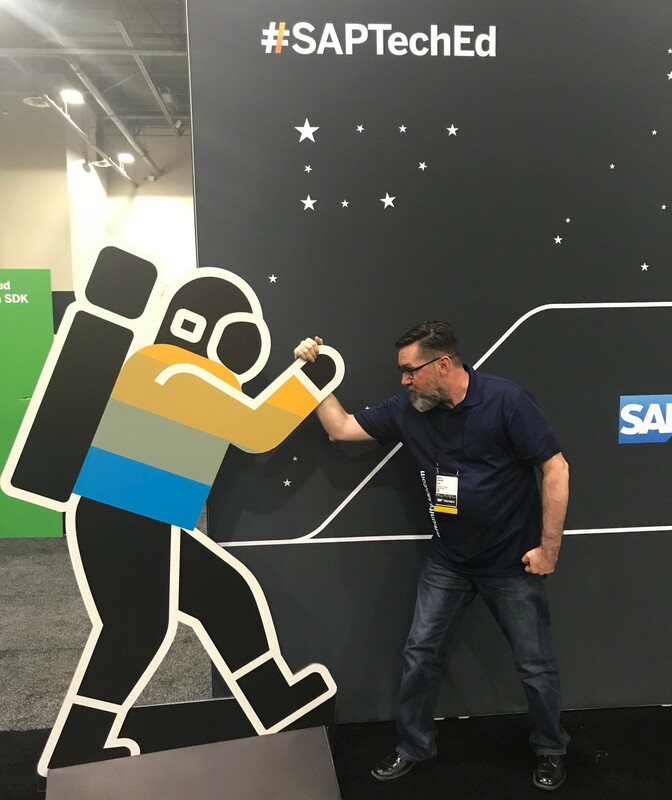 The kids call it a “selfie.” Sure, we have a professional photographer, but that doesn’t mean you can’t (or shouldn’t) snap a pic at our selfie wall…then tweet it with the hashtags #SAPCommunity and #SAPTechEd. After all, you want to impress your followers by letting them know you’re hanging at the Community Lounge, don’t ya? Before I go…you may have noticed that I linked a lot to yesterday’s tweets from SAP Community. You saw that I mentioned the hashtags #SAPCommunity and #SAPTechEd. That’s because when we’re talking about engagement, social media is a great way to connect with the community — whether you’re at the show or not! So please do follow us on twitter. (We’re also on Facebook.) Keep an eye on our page and the #SAPCommunity hashtag. Give us a like, a retweet, a reply. And make sure to include #SAPCommunity and #SAPTechEd hashtags when you tweet from the show. I’ll be monitoring our Twitter feed all day (and throughout the event) and I’d love to hear from you. Remember — it’s all about engagement! I can’t be at Teched! But I will be following on Twitter! All there is to do there. I always loved going and it never got old. You’ve highlighted some very bright spots in the conference indeed. I know everyone who went is enjoying their time, learning, and above it all having a great time!!! Remember if you went there without a co-worker. Someone else did too! Look for those people to hang out with. They are pretty interesting. If you did go with a co-worker, find those people too. You’ll learn something you didn’t know. It is really nice to see this community focus at such a large event like SAP TechEd. 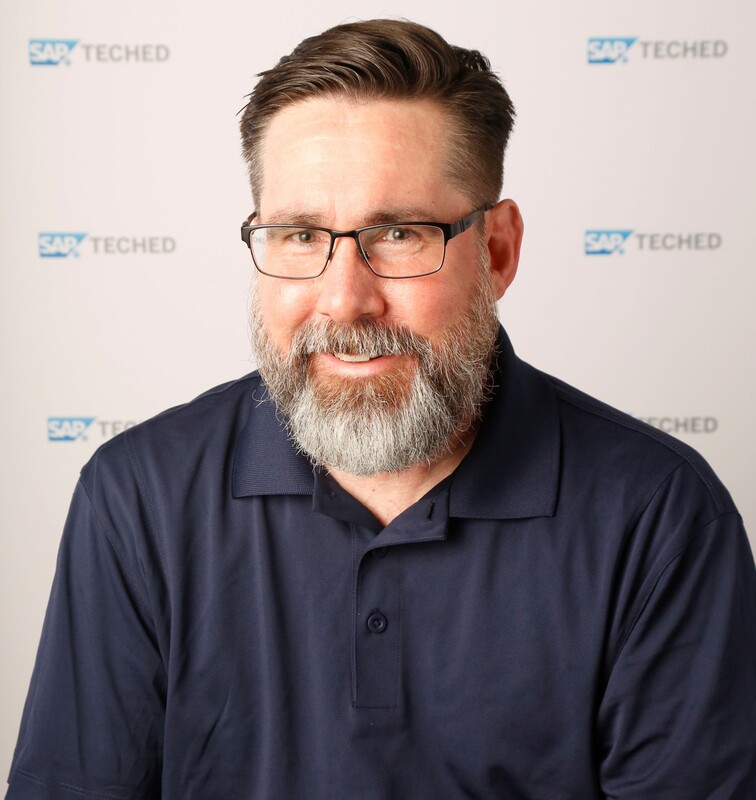 I’ve been going to SAP Inside Tracks for some years, even organized one this year in Brazil, but soon I’ll finally have my first experience at an SAP TechEd in Barcelona. Looking into these big events’ contents I can more clearly understand how important the SIT events are. 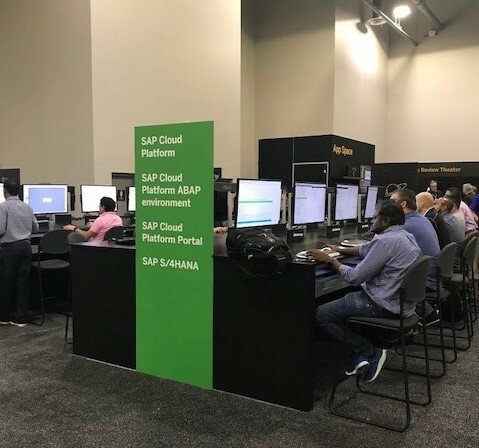 They can be like a mini/micro SAP TechEd where we can share knowledge with all the people who are eager to learn and connect but can not travel and/or pay to be on the large-scale events. I think this is the power of a strong community, made of different types and sizes of events for everybody. Now I am looking forward to knowing the European versions of the Community Lounge and Developer Garage. So do you have plans to be at SAP TechEd BCN as well? If so we can catch up there. I’m afraid I won’t be at Barcelona this year, but there will still be a strong Community contingent in attendance. So if you’re there, please stop by the Community Lounge. All the cool stuff I wrote about in Vegas should be happening in Barcelona too!